Haynie described the problem at the plant before he took over as persistent and said it was due to technology that failed routinely. The plant operates efficiently today, he said, but the membranes continue to be difficult to manage. Haynie said one of the reasons he wants to move forward as early as April on construction of the 1.5 million gallons per day replacement is to get rid of the membrane filtration technology that has crippled the plant in the past. It is essential to move quickly on the replacement, Haynie said, since the current .667 million gallons per day plant is near capacity and the expanded plant will only get the county to a little beyond 2020. The county, without further public discussion, never followed through on that vote. On April 27 of 2015, Mark Thomas, then a member of the School Board and now a member of the Board of Commissioners, showed Davis a video he had shot at the discharge point of the Calls Creek plant. Thomas and his brother own property near that site. The video, which I obtained and posted on June 3, showed very dark water being discharged from the plant into the creek. I had learned of the problems at the plant earlier that year, and I had filed an open records request on May 20 to get correspondence regarding the problem. I received a response on May 26 confirming that county leaders were working with an outside consultant regarding operation of the sewer plant. EPD refers to the state Environmental Protection Division. Benko is the county administrative officer. The documents I received on May 26, two hours before Davis read his statement, made reference to the outside report by Bob Sheldon of Dacula, which I received subsequently. Sheldon said he found the Calls Creek plant in disrepair and that the problems, including faulty maintenance of equipment, had persisted for at least a year. But he gave no indication of the reason for the dirty discharge. Haynie was hired in August of 2015 to fix the problems at the Utility Department, and he has spoken generally about faulty operation of the plant. At a Dec. 12, 2015, tour of the plant organized by Haynie, Wastewater Operator Paul Ludwig said the membranes were not properly maintained during the period leading up to the Sheldon report. Haynie put the blame at the Commissioner meeting on Wednesday directly on the membranes. 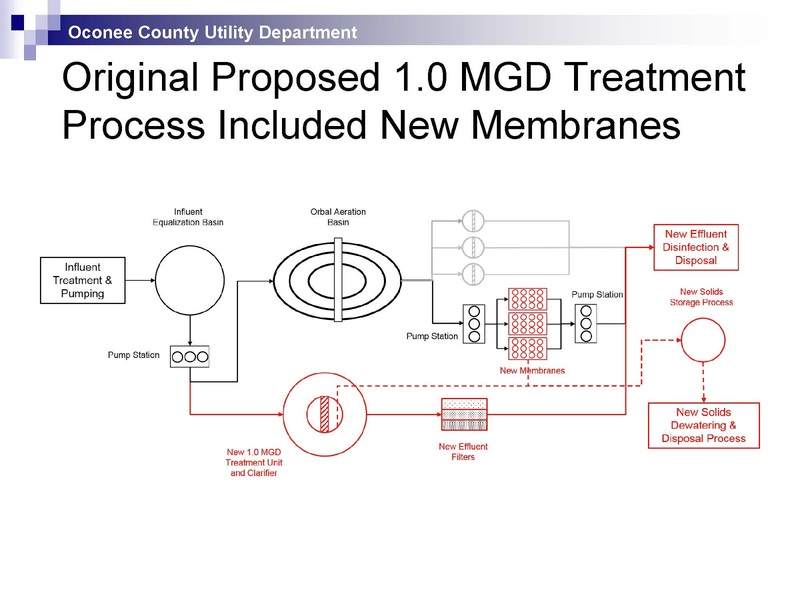 The membranes serve as the clarifiers in the existing plant, Haynie said. A clarifier is used to remove solid particulates or suspended solids from liquid. 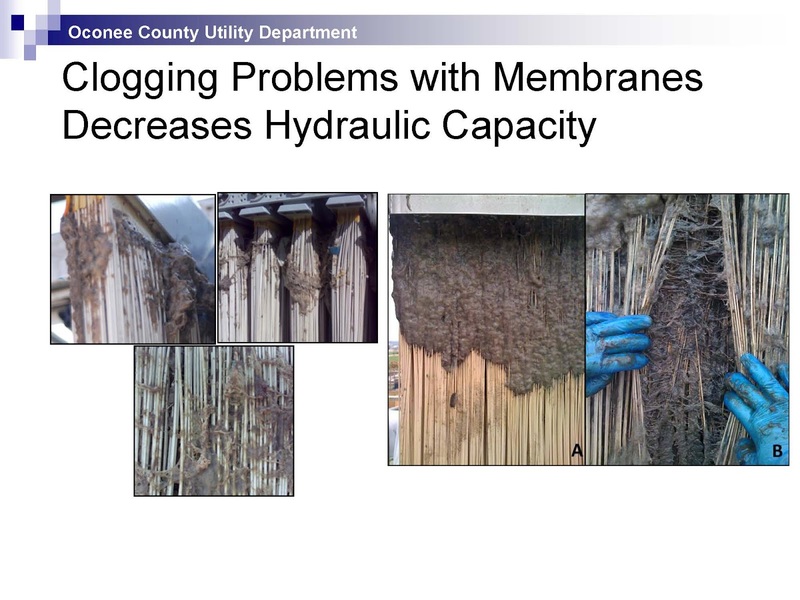 Haynie said the screens leading to the membranes failed, and the membranes became clogged and could not do their job. No one has said how long the plant operated under the failed membrane condition, though Sheldon’s report suggested it could have been a year. I have been told by people with knowledge of the plant operation during that time that the plant functioned properly during the day because the staff reprocessed the water until it was clear but that the plant discharged dirty water at night, when the plant was unstaffed. Somehow, the records submitted to EPD never reflected the problem, though sampling is supposed to be done around the clock by self-operating devices. The state Environmental Protection Division had informed Commission Chair Davis as early as September of 2013 and again in November and December of 2014 of problems at both of the county’s sewage treatment facilities, including issues of routine and required record keeping. The EPD reports also identified problems relating to the way samples were drawn. The county experienced “fouling” of the membranes when the screens broke down, he said. “Everybody remembers the videos and the newspaper articles,” he said. 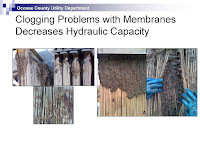 Haynie’s comments about the problems with the membranes start at 5 minutes in the video below. OCO: Haynie On Calls Creek Expansion from Lee Becker on Vimeo. Haynie told the Commission that it should move quickly on the Calls Creek plant because it is the fastest solution to the crisis of capacity before the county. He said a new plant could be operating in 12 to 18 months if the Commission gives him the go-ahead in April, as he is hoping is the case. He reviewed the decision he inherited initially to expand only to 1 million gallons per day and his subsequent recommendation to go to 1.5 million gallons per day. The new plant would be on property east of the existing plant that the county already owns. The diagrams here and below show that land, the existing plant, the proposed 1 million upgrade that was approved back in 2008 but never put into place, and his current plan. Click on any of these to enlarge it. Haynie’s explanation and justification of the current plan is at the front of the video above. Chris Thomas, Haynie’s predecessor, had come before the Board of Commissioners on Nov. 20, 2008, to make the case for an upgrade of the Calls Creek plant from its existing .667 mgd to 1 mgd, arguing that demand called for the expansion. 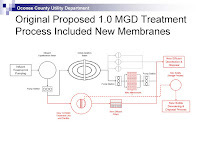 Chris Thomas, who is not related to Commissioner Mark Thomas, proposed continued use of membranes for the filtration process. The Board approved that action at its meeting on Dec. 2, 2008, at which time it restricted all use of new sewer capacity to commercial development. At Haynie’s urging, the BOC has changed that policy so that 40 percent of total capacity is for residential use, 40 percent is for commercial use, and 20 percent is for industrial use. At present, all of the residential use, under this formula, has been allocated, according to Haynie. During that discussion back in 2008, then Commissioner Chuck Horton had asked whether the county could buy back some of the unused capacity it had sold to developers as a way to reduce the demand on the plant, and County Attorney Daniel Haygood indicated the county could do that. Haynie told the county’s Industrial Development Authority last year he had proposed to then Chairman Davis repurchasing capacity as a way to address the problem before the county and that he was told by Davis not to do that. I had put the video of the work session between Chris Thomas and the BOC on the Oconee County Observation Vimeo site back in 2008, but I rendered it again today in an effort to improve quality and uploaded it a second time. OCO: BOC Work Session 11 20 2008 from Lee Becker on Vimeo. 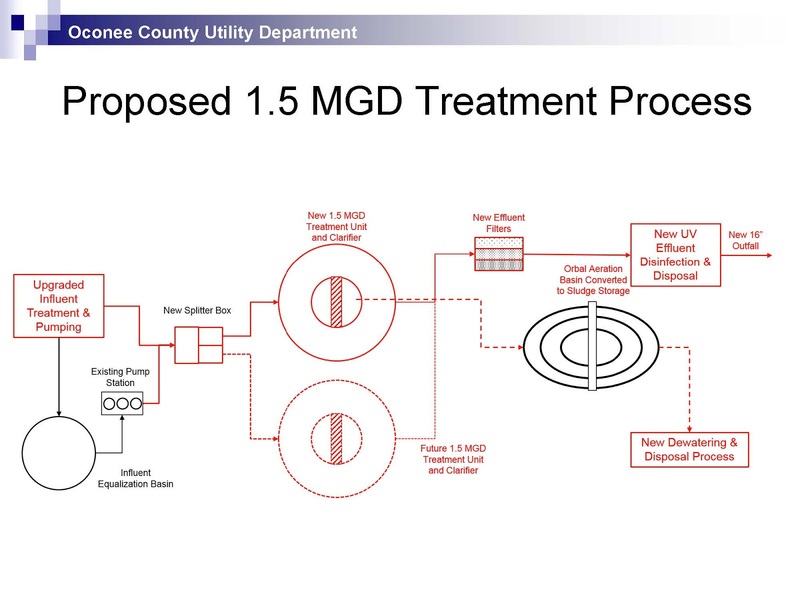 As I noted in my earlier post on the Wednesday work session of the BOC, most of the attention was on the possibility of putting a plant on the Middle Oconee River, rather than expanding the Calls Creek plant beyond 1.5 mgd. Haynie did say that expanding beyond 1.5 mgd is an option for the future given that land is available and neighbors accept the plant. Expanding the Calls Creek plant beyond 1.5 mgd has resulted in vocal opposition from residents along Calls Creek, who don’t want a pipeline down the creek and through their yards. 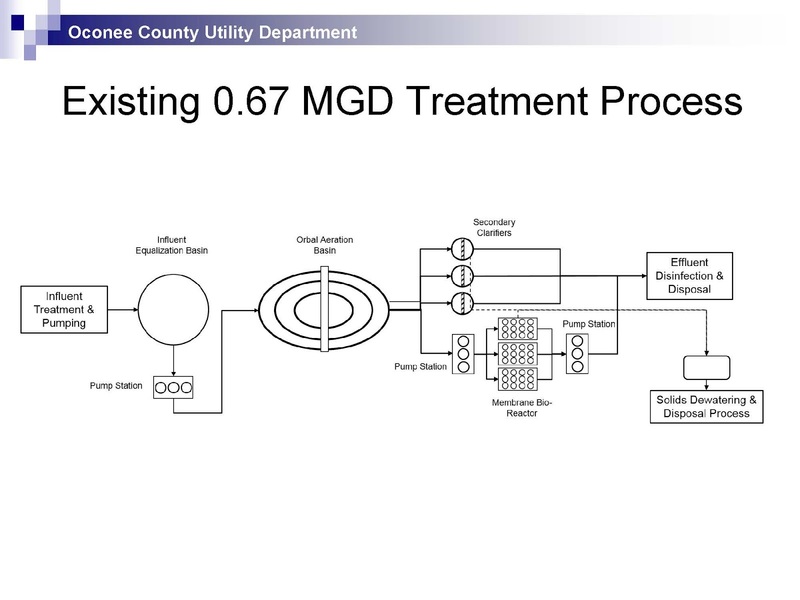 The state has said that the county cannot discharge more than 1.5 mgd of treated wastewater directly into Calls Creek, and the pipeline down the creek would allow the county to get that discharge to the larger Middle Oconee River, where the state has said it would be allowed. A sewage plant has operated at its current location just north of Watkinsville on Calls Creek since 1982, and before that time raw sewage from Watkinsville was dumped into a tributary of Calls Creek, Jimmy Parker, former county engineer and now consultant to the Utility Department, told the BOC on Wednesday. Residents have grown accustomed to the plant, with many saying they were even unaware of its existence until surveyors appeared in their yards and the controversy involving the pipeline surfaced. None of the residents came forward to complain publicly about the discharge of only partially treated sewage water during the period, likely as long as a year or more, when the plant was malfunctioning, or even after I posted the video and stories appeared about the issue in area newspapers. Expanding the Calls Creek plant beyond 1.5 mgd got a setback on Wednesday, however, when Parker told Haynie and the BOC that the collection system in place that feeds the plant cannot handle much beyond the 1.5 mgd level. Parker told me in an email message yesterday that the proposed Epps Bridge Parkway/Daniells Bridge Road upgrade Haynie wants to undertake in the next few months will include a 12-inch force main. That 12-inch line served by a pump at Epps Bridge Parkway near Kohl’s will will have a maximum capacity of approximately 2.25 million gallons per day, Parker said. 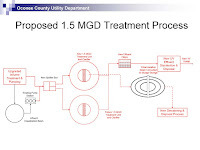 So the county would have to expand that line again to handle the sewage that would flow to a 3 mgd plant. I did not interpret the discussion of membrain issues as the reason for the problems at Calls Creek. I believe the comments were designed to explain why the filtration system is not a feasible technology. Even Chris Thomas was recommending a package plant solution because of the membrane operational issues. The membranes are at the end of the process in the existing plant. As Wayne said, they are the clarifiers, following behind the biological treatment process. He said the supplemental clarifiers are too small to operate on their own. So if the membranes are not operating correctly, the result is dirty, but treated, water. Chris Thomas also recommended getting rid of the membranes because he, too, had concluded they are too expensive and difficult to operate. He made that case when he pitched the stand-alone system to the Commission. The membranes were not the only problem at the plant. But if they were clogged and the water was not clarified subsequently, dirty, but treated, water was going to get into the creek. That is why Haynie focused on the problems with the membranes in the video clip in the post when he also talked about the video of dirty water and the negative media coverage. "Haynie told the Commission that it should move quickly on the Calls Creek plant because it is the fastest solution to the crisis of capacity before the county." Inflammatory language by Mr Haynie. Our county leaders have a documented history of overstating future county growth. Thankfully we have Mr. Becker's reporting to look back on. And even more important is how much and how fast actual county residents want the county to grow. It's not solely up to the commissioners and IDA...(drain the swamp!). There are so many undeveloped "PVC Farms", and yet the county Planning Director and staff are advocating for more subdivisions. Chuck Horton has a valid point on getting back the sewer capacity for these failed subdivisions. I hope that John Daniell and the commissioners move thoughtfully and carefully on this topic. Please do not fall for this manufactured "crisis". Remember the last crisis, the water shortage? $28 mill in bonds for the Hard Labor Reservoir, and now millions more to get the water from southern Walton County to here?? Sorry, the county and its leadership have made too many mistakes in this arena for far too long. Going to take time and a lot of hard work from county staff and elected officials to regain credibility in regards to water, sewer, subdivision approval, forecasted growth, etc. The word "crisis" was mine, not Haynie's. Paula Feldman, a consultant to Haynie, did say “We are in urgent need of additional capacity.” I called that a crisis. You are correct in raising the question about demand. John Daniell has challenged some of Haynie's computation in correspondence with me, and the possibility of buying back unused capacity has been raised publicly by Chuck Horton. Feldman presented data on current and projected use at the meeting, and that set the tone for the discussion that followed. Those data show, as I wrote in the first post on the meeting, demand exceeding 1.5 mgd of supply as soon as 2020. 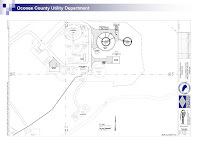 BUY back the sewer capacity and let the PVC subdivisions rezone for septic systems and that will take care of the demand for sewer because of the larger lots required for septic tanks. The larger lot size will mean less houses which will help the school system because of fewer kids. Also less demand on all other county services that seem to be stretched thin. @ Anonymous 7:02 pm - If you believed Chuck Horton could buy back all the outstanding sewer capacity, then congratulations: you've fallen for another politician's lie! Think about it... From a business perspective, no sane land owner would ever give up scarce sewer capacity. If a land owner did sell back their capacity, they would have worthless land. No sewer = no development. No development = no profit. If if were a land holder and the County approached me about selling my capacity, I would charge an outrageous amount to equal the capacity, the cost of the land, and a hefty profit margin. If you a shrewd businessman wouldn't do the same thing, then no wonder you fell for Horton's campaign tactics. No, land owners are not going to sell back their capacity, and the County cannot compel someone to give up said capacity... That capacity belongs to the title holder of the property, and they gave zero incentive to give it up. 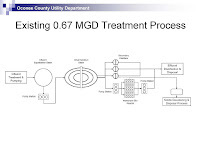 The county only has one option: build a sewer plant that can handle all the outstanding capacity. And if they are smart, build in future capacity to provide a protective cushion which will ensure this "crisis" doesn't happen again. The county ordinance gives the county the right to refund the capacity fee if the developer has not used it in three years. 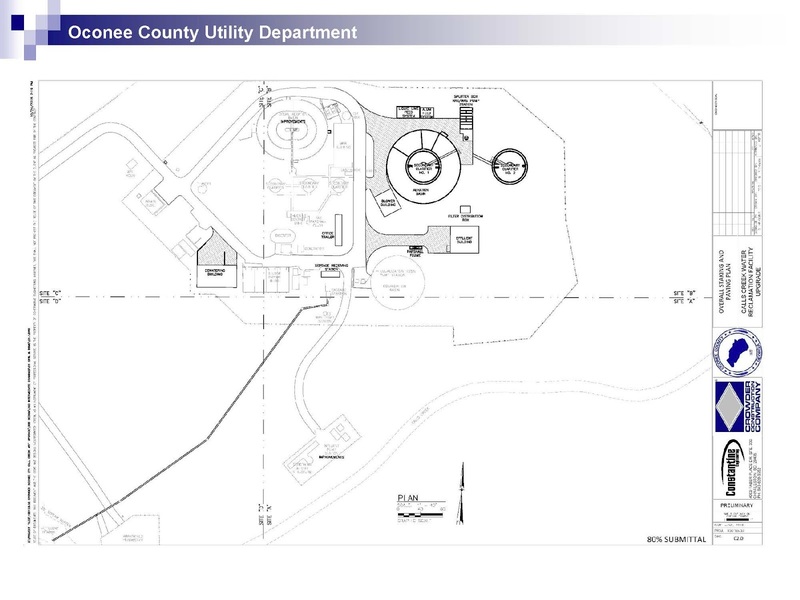 "Upon payment of such charges, capacity shall be reserved for a period of three years; however, should the applicant not have connected to the Oconee County sewer system by the expiration of such three years, the County may elect to refund any such charges. Upon such refund, such party shall no longer have any claim for capacity in the Oconee County sewer system, nor any priority for same." To 10:08 PM. After reading Lee's explanation of the ordinance it looks like 7:02 PM's simplistic idea may not be that impossible after all. Sometimes business ventures just don't pan out and you just have to take it on the chin and cut your losses. Maybe the greed of the burst bubble of the boom time is coming home to roost with more common sense planning. Refund the money for the sewer. If a developer wants sewer then let them pay all cost to run it. The usage fee doesnt even come close to covering the actual cost to the taxpayers. Lee, when was that refund ordinance passed? And does it apply to all property that had capacity prior to its passing? In other words, are all the properties that had capacity before the passing of this ordinance "grandfathered?" Or if they aren't "grandfathered," did the three-year stopwatch start ticking after the ordinance was passed? Or does the clock start retroactively from the date of the issuance of the capacity? Or does the clock reset every time the land is sold from one developer to another? A thorny, complex issue with solutions guaranteed to close the eyelids of most citizens trying to understand. When first built, the Calls Creek plant was state of the art. What we can gather now is that it is now plagued with problems sounding an awful lot like mismanagement, apathy concerning proper maintenance, and failure to address. This is probably only the first of significant situations "found" rising to bite the new administration. Smart, on-point post by Xardox. How much of the issue was a lack of proper maintenance? Why did it take so long to react? I've heard from former and current employees that they brought their concerns to the commission and Benko, but Melvin hemmed and hawed. We'll never know the truth, as the public was kept in the dark until it was too late. Thank you Xardox for summarizing the mess. The Oconee County Commissioners approved purchasing a "Ferrari", albeit years back. A "Ferrari" is the very top of the line. And part of making the conscious decision to purchase a "Ferrari" is the clear and known-in-advance responsibility of maintaining it, even if its "persnickety", time-consuming, troublesome, etc. We trust the commission and staff to use our tax dollars effectively and efficiently. We allowed them to purchase an expensive "Ferrari", and now there's buyer's remorse. And yet they continue to ask for blind trust from county residents in all matters water & sewer. Oy vey. Calgon take me away.